And when your users complain about echo, garbled conversations, or dropped calls, it’s up to you to fix it. Fast. But there are hundreds of reasons for poor voice quality and worse yet, potentially hundreds or even thousands of links, routers, and switches to check across any number of locations. Dealing with VoIP problems can incur resource costs and wasted time, lowering IT and UC teams' customer satisfaction rates. While it is much easier to identify a problem, the difficulty lies in how to resolve it. 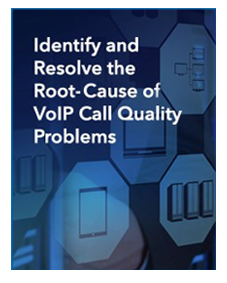 Download this white paper to gain an understanding of how to identify and resolve the root-causes of VoIP call quality problems.